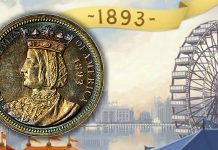 News and Analysis regarding scarce coins, coin markets, and the coin collecting community #128 ….. 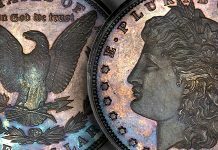 The ‘High Desert’ set and the set assembled by Gerald Forsythe are the two highest ranked sets of business strike Walking Liberty Half Dollars, with major varieties, in the PCGS registry. At the Long Beach Expo this week, these two sets will be on display. This event in Los Angeles County will be open to the public from Thursday, Sept. 6th to Saturday, Sept. 8th. These same two sets were recently on display at the ANA Convention in Philadelphia in August. Fortunately, I was then able to see them. 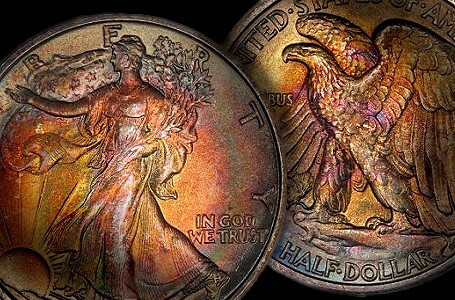 Some of the finest known Walking Liberty Half Dollars may be found in these two sets, which are stunning. This is an introductory discussion of these sets, which is intended for a wide audience. 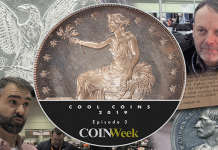 Some specific coins are discussed after Walking Liberty Half Dollars and registry sets are explained. 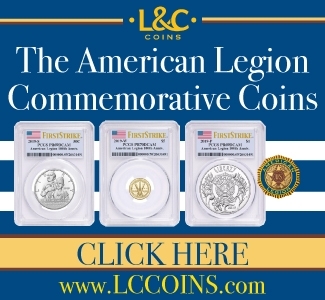 Walking Liberty Half Dollars (Walkers) were minted from 1916 to 1947 and are among the most popular of all U.S. coin series, among collectors. These were well liked by the general public, too. Large quantities were minted to satisfy public demands, though lower denominations, like dimes and quarters, were more likely to be used in vending machines and for a large percentage of purchases with coins in stores. Until the early 1960s, there were millions of Walkers in circulation. Walkers were produced at U.S. Mints in Philadelphia, Denver and San Francisco. Those struck in Denver feature a ‘D’ mintmark. An ‘S’ mintmark denotes San Francisco. Philadelphia Mint Walkers do not have mintmarks. In 1917, mintmarks appeared on the obverse (front) of Walkers, at first. Later in 1917, a decision was made to move the mintmark from the obverse to the reverse (back). For Walkers minted after 1917, mintmarks always appeared on the reverse. In uncirculated (“Mint State”) grades, the key dates are the 1921-S, the 1921-D, and the 1919-D. The semi-keys are the 1921, the 1919-S and maybe the 1917-S with the ‘S’ on the obverse (front). The 1917-D (reverse mintmark), the 1918-D, the 1919, the 1920-D and the 1923-S are certainly much ‘better’ dates, meaning these are relatively much scarcer than most dates in the Walker series. There are other better dates, which are costlier than common dates. Most Walkers minted after 1934 are extremely common. The 1938-D is an exception to this rule, as it is relatively much scarcer than other Walkers of the 1934 to 1947 period. In 1986, the U.S. Mint introduced silver bullion coins that featured an obverse design that is very similar to the obverse design of the Walker. This new obverse design is, though, inferior to the true Walker obverse design, in my opinion. 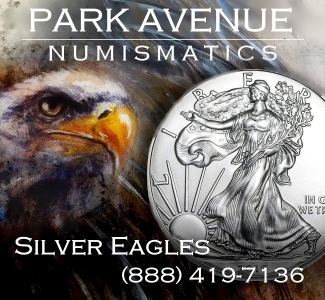 Indeed, Walking Liberty Halves are often thought of as the most attractive of all U.S. silver coins. 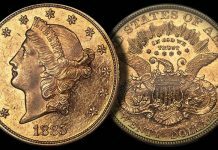 While I personally prefer the Liberty Seated designs of several silver denominations during the 19th century, it is true that more collectors prefer the Walking Liberty Half Dollar design than prefer the Liberty Seated Half Dollar design. Walkers are often collected ‘by date.’ For those who collect Walkers that grade less than MS-65, completing a set is not difficult. Although the current discussion is about sets of Walkers that grade MS-65 or higher, it is worth noting that Walkers are not expensive in low grades. Collectors with modest budgets can afford them. Back in Oct. 2011, I cited John Albanese in regard to collecting well-circulated (sub-50 grade) Walkers. 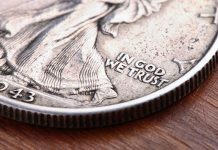 “Except for a half dozen better dates, circulated Walkers can be bought for melt [silver bullion] value or a little above melt value at small coin shows or coin stores,” Albanese declared. In Good-04 grade, 1916, 1916-D and 1916-S Walkers all cost less than $100 each. In this grade, the 1921 and the 1921-D are the only two that cost more than $100 each. In MS-63 or higher grades, however, there are more than a dozen different dates in this series that retail for above $1000 each. In MS-65 or higher grades, the gem quality range, there are are more than a dozen different dates of Walkers that retail for amounts greater than $5000 each, several of these routinely sell for more than $10,000 each. Most collectors of Walkers buy circulated (sub-60) coins and build ‘date’ (and Mint location) sets. Few collectors seek die varieties of Walkers. In theory, a collector could collect ‘by year’ and ignore Mint locations. Although there is a PCGS registry category for such “date” (year) sets of Walkers, I have never met anyone who collects Walkers in this manner. Such a practice does not make sense, in my view. An interested collector who cannot complete a set ‘by date’ (AND U.S. Mint location), or is not ready for such a quest, should first build a limited ‘type set,’ with one representative of each design type. 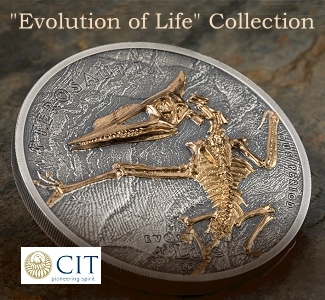 A type set may be limited to one metal, such as silver, to one century, or to one denomination, such as half dollars. A type set may also be planned as a combination of the just mentioned categories of limited type sets. For example, a collector could assemble a silver type set of half dollars and quarters of the 20th century, for a very low cost. While building a type set is a good way for beginners to get started, collecting Walkers ‘by date’ (including all mints) may be as well. Walkers are not complicated. 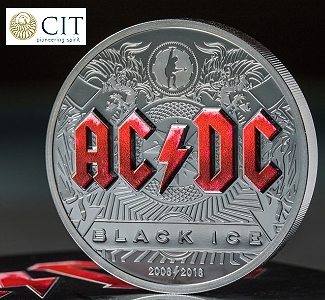 Those who are buying MS-64 and higher grade representatives of better dates, however, should consult an expert about selecting coins, especially before acquiring key and semi-key dates. In the PCGS registry, a distinction is made between a “Basic Set” of business strikes and a set “with Major Varieties.” At a glance, the only added ‘major variety’ seems to be the 1946 with “Doubled Die Reverse,” which is a rather obscure variety. It is relatively scarce in high grades. The PCGS retail price guide values Walkers of this variety at $40 in Good-04 and at $2600 in MS-65 grade. I suggest completing most of the rest of the set before focusing upon this variety. 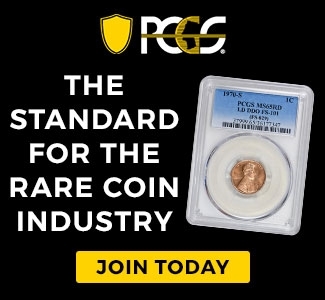 The PCGS registry involves collectors registering their PCGS graded coins in any of a multitude of categories, with the idea that registrants seek to complete (or nearly complete) sets with the highest graded coins that they can each afford. 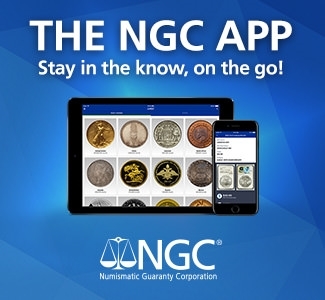 In regard to most (not all) sections of the PCGS registry, it is implied that participants seek high quality, PCGS graded coins to build sets and to attain substantial registry point totals, which serve as means to measure (or score) sets in competitions. Although there are competitions in most sections of the registry, participants are welcome to register their sets just for fun without thinking about the competitive aspects of the system. In a given category, the set that has the most registry points is the winner. Every year, a winner in each competitive category is announced and awards are given. 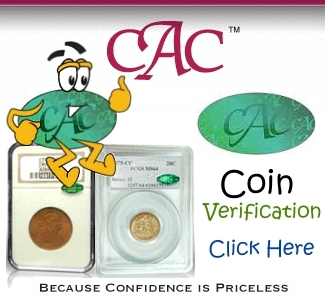 Every coin in a registered ‘set’ has a point value that is based on a formula, which incorporates rarity, PCGS grade, and, in some cases, other factors, such as PCGS designations. A key date that is graded MS-65 is worth much more, in registry set points, than a common date that is also graded MS-65. Indeed, a key date that is graded MS-63 may amount to more registry points than a common date that is graded MS-66, depending upon the respective formula for that particular set. It is not unusual for a rare date to have ten times the “weight” of a common date. In the PCGS registry, there is a distinction between retired sets and active sets. Both retired sets and active sets are ranked in the “All-Time Finest” lists. Only active sets, however, are included in the “Current Finest” lists. Usually, a set is “retired” when the owner sells all or part of it. In theory, an owner may ‘retire’ a set for other reasons. Unless the owner of a retired set asks for it to be deleted, the ‘retired’ set is listed indefinitely in the registry. As both the Gerald Forsythe and High Desert sets of Walkers are intact and will soon be on display again, these are ‘current’! In the “All-Time Finest” and “Current Finest” lists of Walker sets, with “Major Varieties,” the Forsythe set ranks first and the High Desert set ranks second. For some reason, the High Desert set has not been entered into the registry category of a “Basic” set of business strike Walkers. If registered, a High Desert Collection “Basic” set of Walkers would rank near the top in that category as well. After all, a set “with Major Varieties” may easily yield a “Basic” set of the same series from the same owner. The same “Basic” coins may be used in both sets. Indeed, it is not unusual for one specific coin to be in multiple, ‘current’ registry sets at the same time. 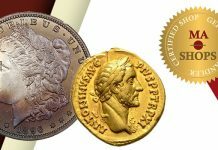 The High Desert Type Set in the PCGS registry includes some coins that are also members of other High Desert registry sets in a few categories. The Forsythe set of Walkers has a weighted grade point average (GPA), according to PCGS formulations, of 66.52 and the High Desert set has a weighted GPA of 65.96. In the “All-Time Finest” list, the next three sets have been “retired,” the most famous of which was assembled by the late Jack Lee. His set had a weighted GPA of 66.27. Lee’s set is not the second finest in the “All-Time” list because it was incomplete. It lacked the 1946-Doubled Die Reverse, which I regard as not being particularly important. The “Ally Collection” set was also missing this variety. The “Ally Collection” set was the winner in this Walkers, “with Major Varieties,” category in 2002, the year in which it was retired. It now ranks fifth in the “All-Time Finest” list. The collector who employed the names “Ally” and “Joshua” is best known for a famous collection of Indian Cents. In the “Set Composition” for the Walker category “with Major Varieties,” the most common dates have a value of one (1.00). According to PCGS experts, these are 1941, 1941-D, 1942, 1943, 1944-D, 1945 and 1946-D Walkers. All Walkers dating before 1941 have a weight of at least 2.00.The 1919-D and the 1921-S are the only Walkers that have a weight of ten (10.00). 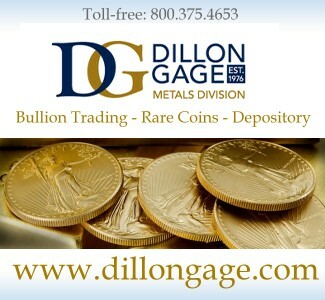 Such weights and PCGS grades of specific coins are inputs to the function that determines the respective registry point values for each coin that is entered in a registry set. “High Desert” is not the name of an individual. It is a code name, as the name of the owner will not be revealed. 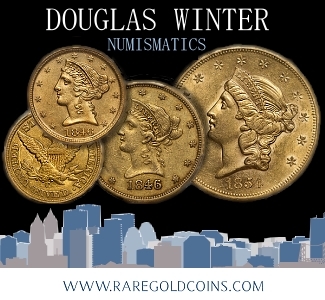 The owner is represented by Scott Travers, a well known coin expert and author. The seventh edition of his Coin Collector’s Survival Manual is widely available. This set of Walkers is just one part of the High Desert Collection of coins, which is phenomenal. The High Desert comprehensive type set, and limited type sets derived from it, have been top ranked in the PCGS registry for many years. There are several other highly ranked, registry sets in the High Desert Collection, including sets of Lincoln Cents, Jefferson Nickels and Standing Liberty Quarters. An incredible group of large cents from the High Desert Collection will probably be displayed in Jan.2013 at the FUN Convention. While “High Desert” is a code name, Gerald Forsythe is a real name. 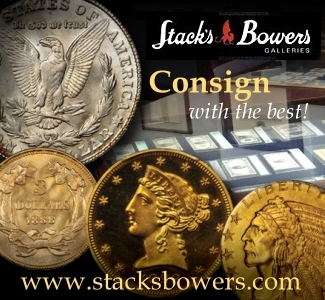 Forsythe is a leading collector of 20th century nickel and silver U.S. coins. His sets of Buffalo Nickels are legendary. His sets of Mercury Dimes are highly ranked in the PCGS registry. Furthermore, he has collected other series of U.S. coins as well. 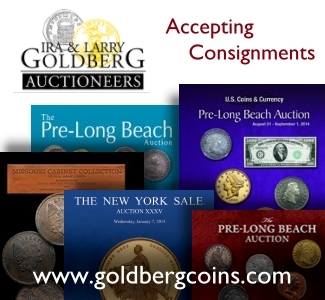 Additionally, his extensive collection of Hawaiian coins and patterns was auctioned by the Goldbergs on May 28, 2012. Forsythe is a very enthusiastic coin collector. I am enthusiastic about the Desert 1920-S Walker. It is very attractive to extremely attractive. The toning, mostly light overtones, is wonderful overall. Various shades of russet are complemented by subtle tan and blue shades, with a very pleasing mellow green hue on the reverse (back). 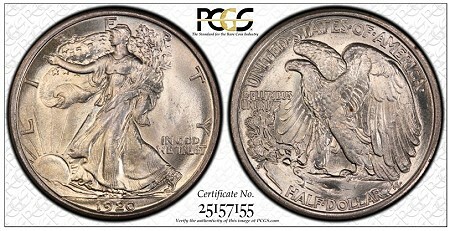 It is PCGS graded MS-65, and upgrading it to ‘65+’ would probably be fair, in my view. In his book on Walkers, Jeff Ambio emphasizes that the “central highpoints on both sides” of 1920-S halves tend to be weakly struck. While this is true of the reverse of the Desert 1920-S, the obverse is unusually well detailed. 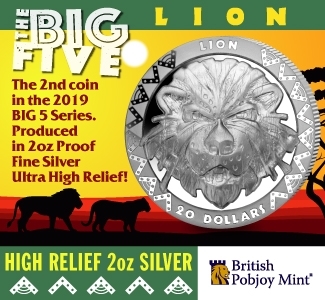 This is a very impressive coin overall. As it does for the 1920-D , the PCGS registry assigns a “weight” of 8.00 to the 1920-S. In my view, the 1920-D is significantly scarcer than the 1920-S, overall. These two dates, though, may be about equally scarce in MS-64 and higher grades. When the PCGS registry was founded, it might have been assumed that almost all registry participants building sets of Walkers would be seeking coins that grade MS-64 or higher. 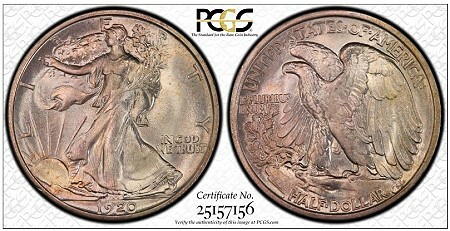 For the 1920-D and the 1920-S, just six of each are PCGS graded higher than 65 and not one is PCGS graded higher than 66. The Desert 1920-S is one of forty-six that have been graded MS-65 by the PCGS. This total probably represents, at most, thirty different coins, and the Desert 1920-S is one of the best of these. 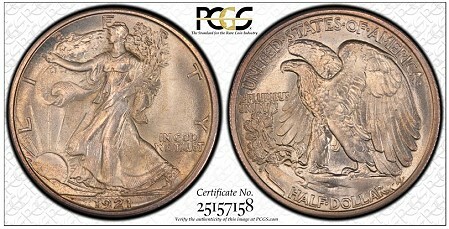 Forsythe has one of the five 1920-S Walkers that is PCGS graded MS-66. The obverse (front) of the Desert 1920-S is much more sharply detailed than the obverse of the Forsythe 1920-S. Moreover, the Desert 1920-S is much more attractive overall. Though the Forsythe 1920-S may score higher in the technical category, the Desert 1920-S is a more exciting coin. If these sets are ever auctioned, I would suggest that collectors of gem Walkers seriously bid on the Desert 1920-S. When I walked over to the PCGS table on Friday, Aug. 10, 2012, at the ANA Convention in Philadelphia, I noticed that the 1920 and the 1920-D Walkers in the High Desert set each have a pedigree of “Pryor” noted on their respective PCGS holders. I do not know whether these two were in the auction, by Bowers & Merena, of the James Pryor collection of half dollars in Jan. 1996. I did not attend that sale and I do not have immediate access to a copy of the auction catalogue. Pryor is a legendary collector of half dollars and this 1996 sale of his coins was an epic event. If I could live life over again, then I would attend that auction and I would do some other things that I never got around to doing. According to Jeff Ambio, a PCGS graded MS-66 1920-D was in the Pryor Collection and sold in that Jan. 1996 auction for $12,100, as lot #347. Presumably, this is the High Desert 1920-D. 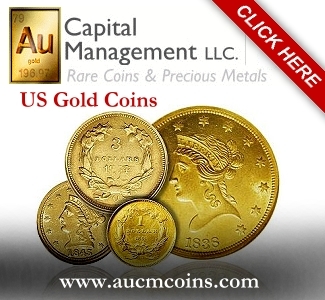 Many U.S. coins are now worth multiples of their respective market prices in Jan. 1996. The PCGS has graded six 1920-D Walkers as MS-66 and has not assigned a higher grade to a 1920-D Walker. Ambio believes that five to seven different 1920-D Walkers grade MS-66. 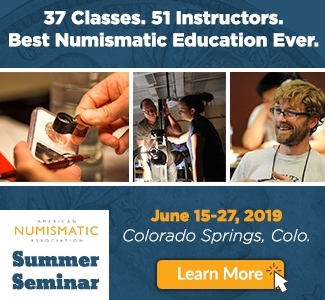 Furthermore, Ambio remarks that forty to fifty 1920-D Walkers grade MS-65 and that a total of three hundred to four hundred in all “Mint State” grades survive. If so, the 1920-D would be truly rare in ‘Mint State,’ which is unusual for a 20th century coin. Jeff Ambio is the chief cataloguer at Stack’s-Bowers. 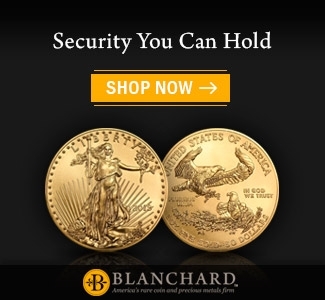 He is also the author or co-author of at least three books on coins. His book on Walking Liberty Half Dollars was published by Zyrus Press in 2008. In the PCGS registry, the 1920-D Walker has a “weight” of 8.00, which seems to imply that experts at the PCGS find it to be a semi-key date. As I said already, it is a better date, not really a semi-key, in my view. I am surprised by Ambio’s estimates of its rarity in ‘Mint State’ grades. I suggest that there are more than four hundred, “Mint State” 1920-D Walkers in existence. The Forsythe Collection also contains a PCGS graded MS-66 1920-D. Though I did not ask for the Forsythe 1920-D to be removed from the case, and thus did not examine its reverse, my preliminary impression is that the Desert-Pryor 1920-D is of higher quality than the Forsythe 1920-D, though I would not say that the grade of either is in the high end of the MS-66 range. 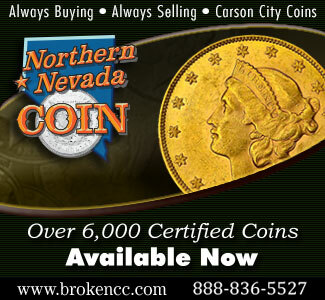 For simplicity, I sometimes refer to High Desert coins as just “Desert” as the term ‘high’ has many meanings, some of which relate to coin grades or coin prices. 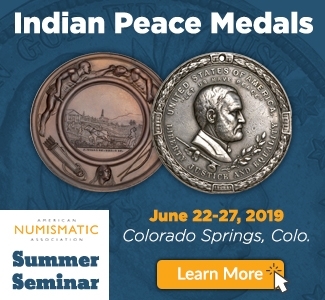 The Desert-Pryor 1920-S has too much of a ‘dipped look’ for my personal taste, though some collectors of Walkers, along with many collectors of Morgan Dollars, prefer very apparently dipped coins. Given widely accepted criteria, the grade of the Desert-Pryor 1920-D is in the MS-66 range, though in the ‘low end’ of that range. It has quite a few contact marks, some of which are readily noticeable. I just did not become really excited about it. I am enthusiastic about the Desert 1921-D. 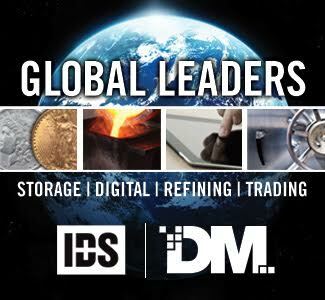 Though the organizers of the PCGS registry do not place the 1921-D in the same league as the 1921-S and the 1919-D, as I said above, I regard the 1921-D as one of the three keys. The Desert 1921-D is PCGS graded MS-65 and the Forsythe 1921-D is PCGS graded MS-66. While I held the Desert 1921-D and tilted it under a light, I saw the Forsythe 1921-D in a display case. I thus cannot draw a conclusion about the Forsythe 1921-D. The colors on the Forsythe 1921-D are unusual and vibrant. It attracts a great deal of attention. I am sure that I really like the Desert 1921-D. It is more than very attractive. It looks much better in actuality than it appears in images published by the PCGS. The russet and green tones are mild, subtle in some places. There are some light brownish-russet patches. Overall, if my memory serves well, the Desert 1921-D scores highly in the category of originality. Furthermore, this coin has very few, noticeable contact marks. Though I was standing on a bourse floor, and thus not comfortably seated in a properly lit grading room, I tentatively suggest that its grade is in the high end of the MS-65 range. The 1921-D is rare to very rare in all ‘MS’ grades, meaning there are between 250 and 500 uncirculated 1921-D Walkers in existence. In the gem quality (65 and higher) range, the 1921-D is a prime condition rarity, behind only the 1921-S and the 1919-D Walkers. While the PCGS reports having graded thirty-one as MS-65, I doubt this total represents more than twenty-two different coins. There are none that are PCGS graded ‘MS-65+,’ though maybe this should have been the first one. Just three 1921-D Walkers are PCGS graded MS-66 and I believe that this total represents three different coins. The Desert 1921-D is very appealing and very important. I would like to see it again. As Jeff Ambio emphasizes, a large percentage of ‘Mint State’ 1921-S Walkers have been significantly dipped and their respective luster, which was usually not that vibrant before dipping, typically became “muted” by dipping. My impression is that the Desert 1921-S, even though it has been moderately dipped, is one of the best survivors. It is lustrous enough. Importantly, it has naturally retoned to a fair extent, with light to medium shades of brownish-russet in a few areas. I tentatively suggest that the grade of the Desert 1921-S is in the middle of the 65 range. If it had been more sharply struck, it might very well merit a higher grade. Probably a dozen different 1921-S Walkers are PCGS graded MS-65 and the Desert 1921-S is better than some of the others. 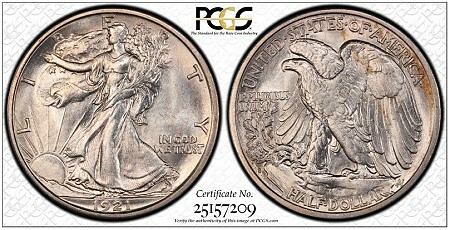 Only one has been graded higher by the PCGS, a single 1921-S has been graded MS-66. It is in the Gerald Forsythe Collection. I am glad that the owners of these two sets, and PCGS officials, all agreed for the two highest ranked sets of Walkers to be displayed, together. It is an exhibit that I would strongly recommend. In sum, my ‘gut feeling’ is that the Forsythe set won the showdown by a substantial margin. To naked eyes, it seems to be markedly superior. Yes, close examinations of each coin with a magnifying glass may possibly yield different conclusions about both these sets of Walkers. The overall ‘look and feel’ of a set, however, is a concept that is different from a reasoned review following a ‘coin by coin’ analysis. It should also be pointed out that, while Forsythe is known for paying above-market prices for coins he strongly desires, the owner of the High Desert sets is geared towards ‘good values.’ Reliable sources suggest that Forsythe is a very emotional collector. In any event, Scott Travers deserves credit for selecting Walkers for the High Desert set, which is impressive, admirable and cool!